We can be rude about the supermarkets but at 7.00pm on a Tuesday evening after work there aren’t that many other options in Birkenhead to pick up some food to cook for the evening. I went in without any great expectations and came out better than anticipated with a couple of duck legs and a pomegranate that was going cheap – so all for less than £3.00. I had at the back of my mind that there were recipes for duck and pomegranate and a quick flick through a couple of books showed I was right although it transpired I could have picked up some walnuts as well. I pierced the skin of the duck legs and browned them in olive oil in a heavy pan over a medium heat for 15/20 minutes. I took them out whilst I cooked off a finely sliced onion and a squashed clove of garlic. I squeezed out the juice from the pomegranate I had bought (wishing I had got two) and the juice from a lemon. This was added to the wilted onions together with a tablespoon of good honey, a seasoning of salt and pepper and a good splash of water. The duck legs were put back into the pan and I put the lid on and left it on a low heat for almost an hour. By that time the duck was cooked but there a good layer of fat on the sauce. So I took out the legs and kept them warm on a plate. Taking the pan off the heat I used some paper kitchen towels to skim off the fat gently layering them down to soak it up before carefully lifting and discarding. Once the fat had gone the pan was put back on the heat to allow the sauce to reduce for a few minutes whilst I cleaned off some green salad from the garden. The rain from the last few days seems to force the soil into all corners of the green leaves so it needed a good soaking. Once it was clean and dry I poured the sauce over the duck legs and used the green salad to help soak up the juices. They were delicious. 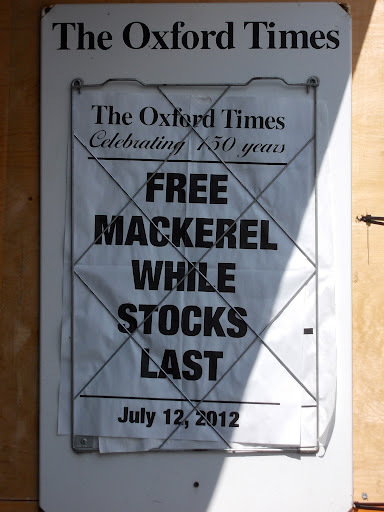 The picture reminded me that I am meant to be finishing the book about mackerel. Galen still remembers the half promise I made three or fours years ago towards the end of a three Murphy’s lunch that once the book was published I would buy a speedboat. Galen forgets that there are a whole range of speedboats and that whilst he has his eye on the thing that David Beckham took up the Thames to the Olympics last Friday evening I will be inclined towards something more prosaic. So this seems like a good time to put something on the cooking of mackerel up here. Catch three mackerel. You should be cooking them within an hour or so of them coming out of the sea. Heat a glug of olive oil or a small pat of butter in a frying pan until hot. Add the mackerel fillets skin side down. You could dust them with flour before putting them in. Once in the pan season with salt and pepper. Cook for a minute and flip them over. You may need to use the spatula to stop them from curling. After another minute take them out and arrange on a plate. Add some chopped parsley and lemon juice. You could slice the fillets into three and eat on pieces of toast. Or even have them whole in a fresh baguette. Mary Arundel cooks them on the bone, dragged through seasoned flour and fried until crisp. Home alone for the rest of the week and the Flaming Lips have a newish CD out so listening to their 10 minute deconstruction of Erykah Badu and The First Time Ever I Saw Your Face which has its moments. Next up The Unthanks with Brighouse and Rastrick Brass Band. Maybe I’m mellowing but I suspect that The Unthanks will get played more than the Flaming Lips – yup put it on now and the hairs are starting to rise on the back of the neck already. I will be a wet rag by the time we get to Fareweel Regality. Another Saturday morning trip to the International Store on Oxton Road to buy some lunch and a another new toy for the kitchen is found. Falafel were wanted for lunch and I knew that I had seen on one of the shelves tucked away at the back various brightly coloured packets that were clearly marked falafel and suggested the possibility of something interesting. So I went to investigate and I was right. There were three or four packets of one sort or other all promising tasty falafel by stirring and mixing with some water. 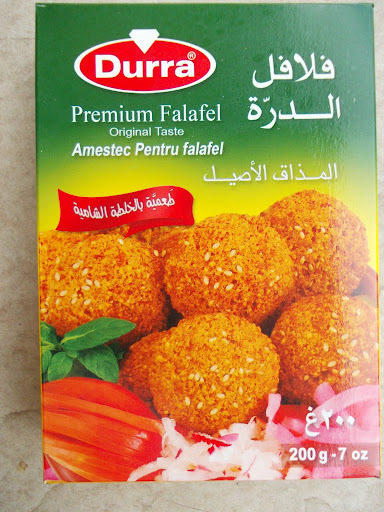 Without having any great idea of what to go for I was sold by the the packet of Durra as it came with its own little falafel maker all for the grand sum of £1.79. Back at home the two packets of powder were mixed with cold water and left to stand for an hour. The time was used up chopping up tomatoes, cucumber and long thin cool green peppers and arranging them neatly on a plate. After an hour the falafel mixture looked too wet and and I was convinced that they would fall apart as soon as I started to fry them. But having started I was going to have to finish the job. So I heated a good covering of oil in a small frying pan. The small metal instrument was simplicity itself to use. It appeared to have been made out of a couple of old tin cans. At the bottom there was a small plate just over an inch wide which was connected to some sort of spring mechanism inside. 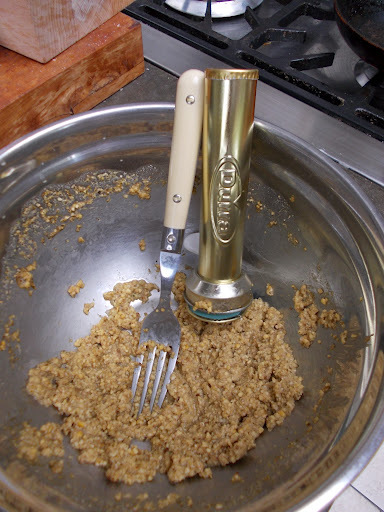 Pull back the lever and smear and spoonful of the mixture into the wide bottom. Then hovering over the hot oil let go of the spring and give it a shake and a small disc of falafel mixture started to frizzle. They held their shape and did not turn to mush in the oil as I had feared. After a minute I turned them over to let the other side cook. After 15 minutes there were twenty or so small rounds of falafel which we ate stuffed into pitta with yogurt the chopped tomatoes, cucumber and pepper and dashes of chilli sauce. Every year I come back from Cork I will have a handful of smoked sausages from Gubbeen. They will have been bought from their stall at Bantry Market on the last Friday of the holiday in a final flurry of enthusiasm and desperation to bring back with me as much of the food of West Cork that I can. Once home I usually quickly realise that it will take some weeks to get through all of the sausage and so some will end up in the freezer. Last night I found two sausages going back to 2005 and 2006. One was a salami and the other salchichon. There was no getting away from it they needed eating up so I took them out to defrost overnight. Galen and I ate them this evening. In town today over lunch I bought from Lunya a glass jar 600 gr of smoked lentils Lentajas al natural extra. When I got home I finely chopped a small onion and started to cook it off in a good dollop of olive oil on a high heat. I added 4 chopped cloves of garlic and cooked that for a few minutes more whilst I peeled and chopped the sausage into dice of about half an inch. 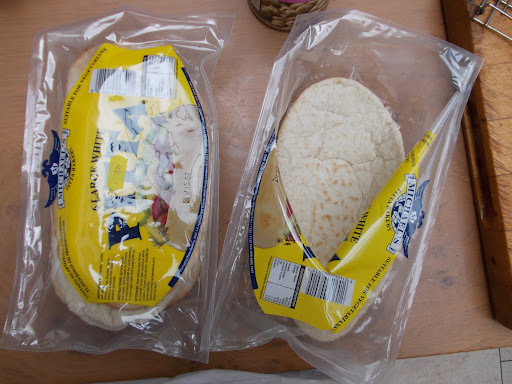 Outside of their plastic wrapper they smelt fine despite their years lurking at the back of the freezer. At the back of the house the sage has been going wild in our wet summer and I finely sliced 4 leaves to add to the onions and garlic together with a half teaspoon of paprika from the 1 kilo tin I bought years ago from Brindisi and is still going. That all continued to cook as I drain the lentils. This took longer than anticipated as the lentils had settled at the bottom of the jar and had to be eased out the air burping and farting behind them. Once into a sieve I sluiced them with water and put them into the pan, the contents of which had started to gain some colour. All this was allowed to heat through, moistened with a slug of the Galician beer I was drinking. There was a final seasoning with salt, pepper and parsley and it was then eaten out of bowls listening still to Giant Sand.